Camden County Sheriff Gilbert "Whip" Wilson and Camden County Police Chief Scott Thomson present the Turkey Trophy to the Woodrow Wilson High School football team on Thursday. The trophy presentation took place in the parking lot at Camden High School after a fight broke out at the end of the game. Two Camden city football teams got into a brawl after Woodrow Wilson High School won the annual Thanksgiving Day game, beating Camden High, 14 to 8. And some fans joined in, apparently. The rivalry between the two schools rivalry is longstanding. Camden High had recently bested Wilson year-after-year in the holiday game. But this year, the Turkey Bowl Trophy was presented to the Tigers in the Camden High parking lot, not on the field, due to safety concerns. Photos of the fights and brief account of the action were posted Friday morning on the Facebook page of April Saul, a retired, Pulitzer prize-winning photojournalist. She termed the fights she photographed a brawl; the photos support that. Saul, who recently bought a home in the city as part of her advocacy for the city, said the words of former standout Camden High football player, Dustin Singleton, on his Facebook page, inspired her to post the pictures, knowing she was the only professional photographer making images at the game. y'all wanna brag about a ----ing fight where 2 team from the same area fight each other. A message to Singleton was not immediately answered. Late Friday district spokesman Brendan Lowe said, "A handful of football players got into a brief skirmish after a rivalry game. This is not noteworthy--it's a slow news day." 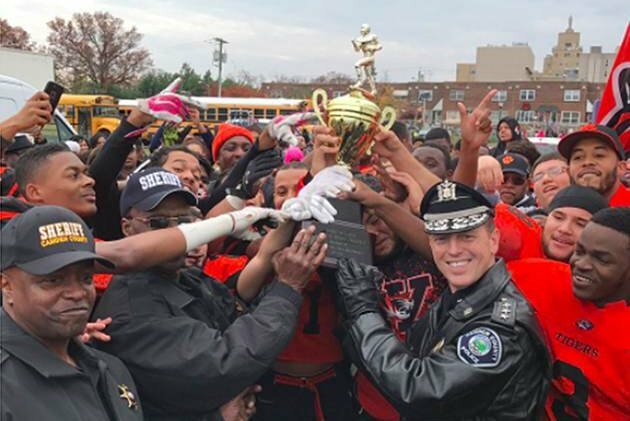 Police chief Scott Thomson, who awarded a trophy to Wilson, said "Nothing occurred at the Thanksgiving Day game that warranted police intervention and was at best some pushing and shoving after a passionate game." "Nothing occurred at the Thanksgiving Day game that warranted police intervention and was at best some pushing and shoving after a passionate game." Chief Thomson said who delivered the trophy to the winning team yesterday. A spokesman for the police said he was unaware of any criminal complaints filed in the aftermath of the brawl.